This Real Estate theme for WordPress is a unique take on the property market niche with a focus on powerful back-end features and providing a clean look and ease of use. You can use this theme if you are an estate agent looking to only showcase properties in your portfolio or to create a property classifieds website. 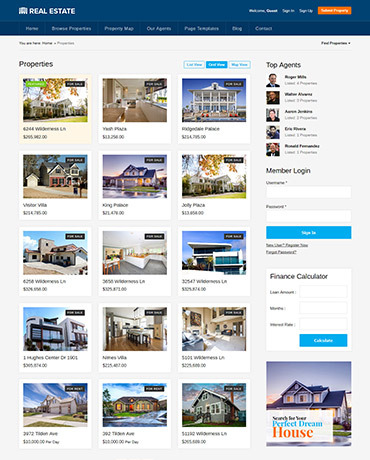 Create your property directory website today with one of the most popular WordPress Real Estate themes. 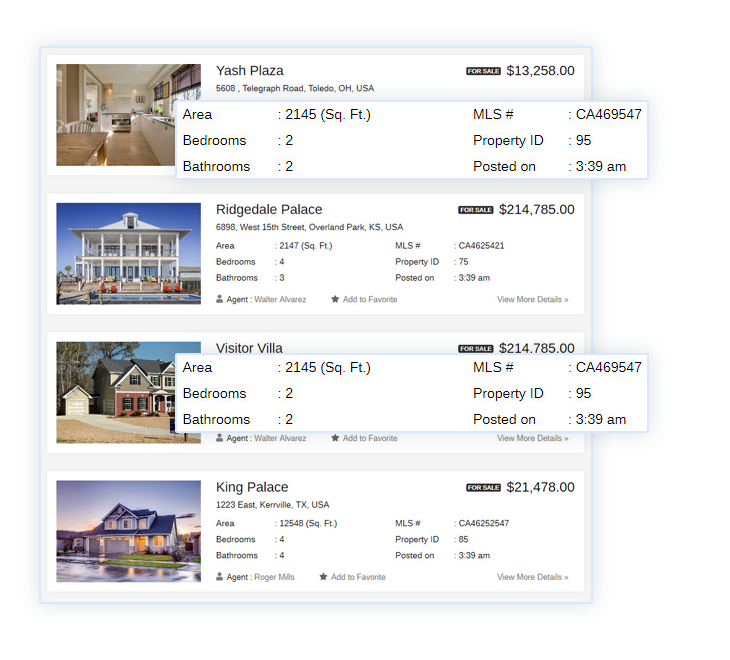 The homepage includes a dynamically generated slideshow of featured properties submitted by the users. 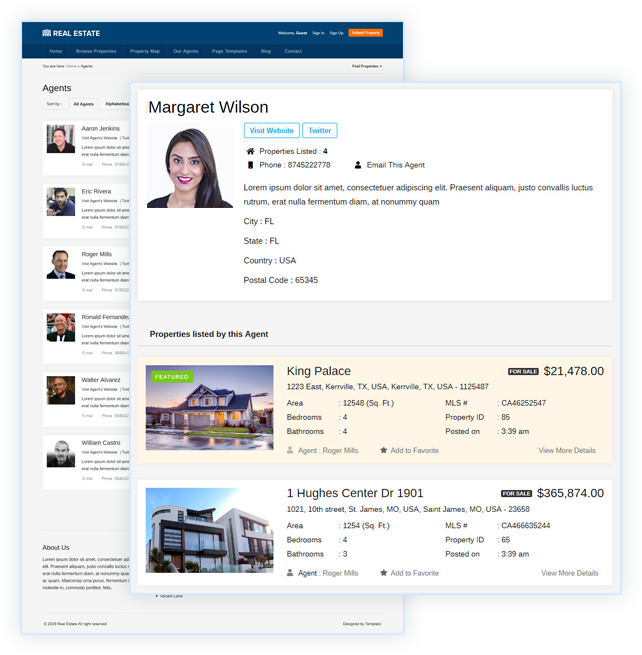 The real estate theme’s advanced search is one of it’s kind where property hunters can refine their search and find properties by criteria. Real Estate comes with multiple widget-ready areas which are designed to let you add the widgets of your choice in the sidebar, big footer or in the center of your property portal’s homepage. 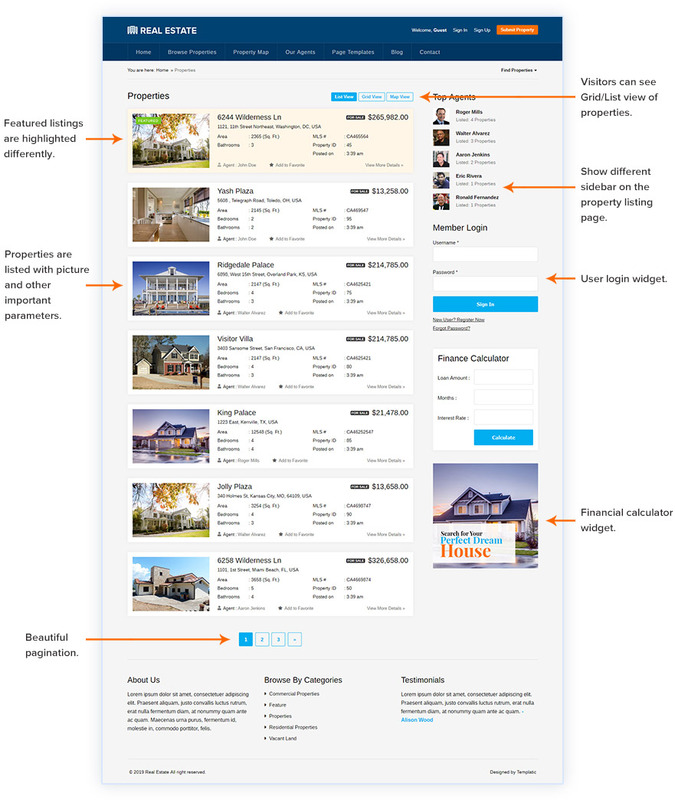 The listings pages shows properties in similar style as those shown on the homepage. This enables your visitors to easily add listings to their favorites and access them in their user dashboard later at any time. Since Real Estate 2 comes with a special widget area for listing pages, customization is a breeze – you just need to drag the desired widget into the appropriate widget area. The property detail page in this real estate theme is where people looking for a properties can see the actual property in all it’s glory. The person who’s listing the property may add photos to the listing’s gallery and those photos will be displayed in a photo gallery slideshow. The property details are displayed elegantly and in strategic manner on this advanced real estate WordPress theme. The agent details are displayed a bit lower with the full contact details and appropriate links so the visitor can get all info about the property being advertised. Contact a listing owner is done by filling out a simple form which is available on each property details page. Messages sent via this form are directly sent to the property listing owner’s email address. The submit property page enables homeowners or estate agencies to submit properties on your site. This is done via the front-end by registering for an account on your property portal first or even during the submission process. The property submission also includes image upload features which let property submitters select and upload images with the listing. Not only this, our advanced Real Estate theme will also resize and arrange images in a dynamic photo gallery slideshow on the property details page. With custom fields you are provided with the tools to easily add new fields to the real estate theme’s property submission form. To make the deal even sweeter, all existing fields are listed in the custom fields section enabling you to effortlessly edit or disable them. Since custom fields can be tied to the search form on your homepage, adding fields to that search form is a piece of cake. 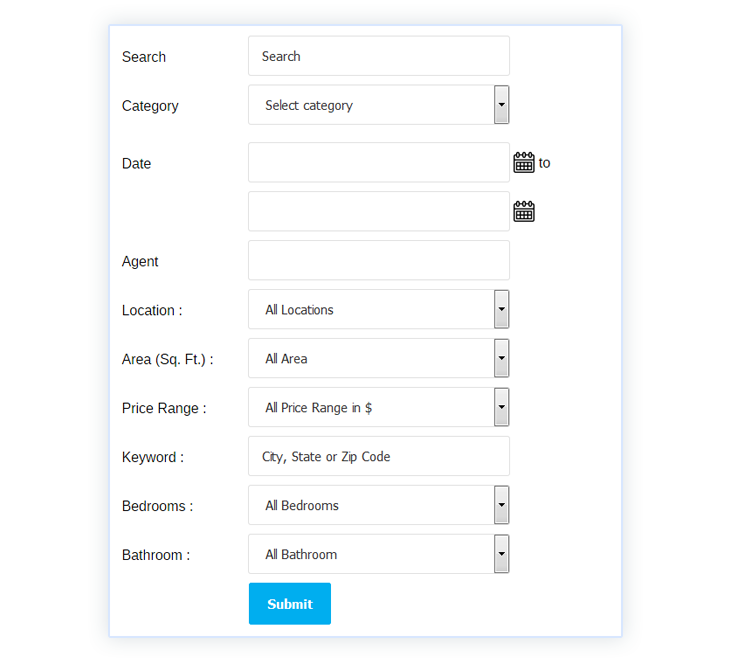 As well as number of bedrooms and bathrooms and other property information fields, you can add more and the fields can also be category-specific if you like. 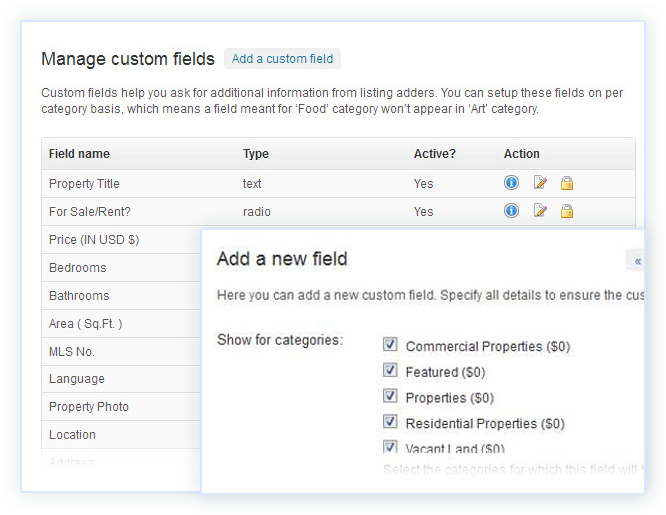 For more on custom fields in our real estate WordPress theme be sure to watch the overview video below. 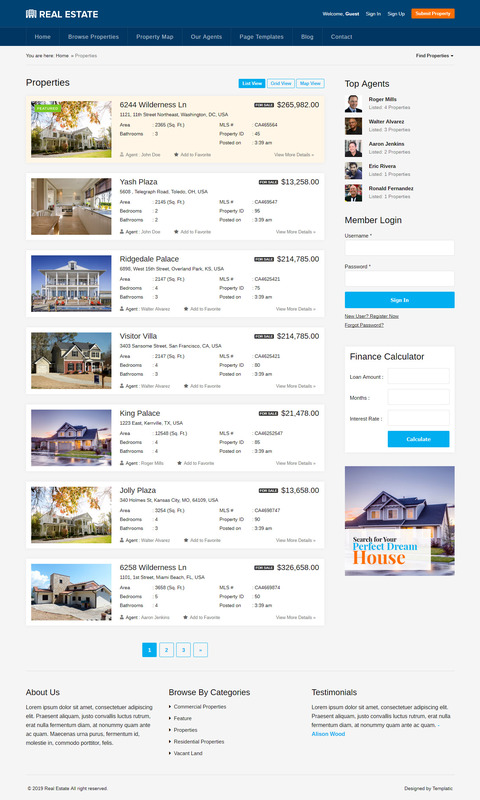 Price packages in this premium Real Estate theme for WordPress provide you with tools to create the ultimate payment plans for your homeowners or estate agents. Want to create category-specific price package? You can do it with Real Estate 2! 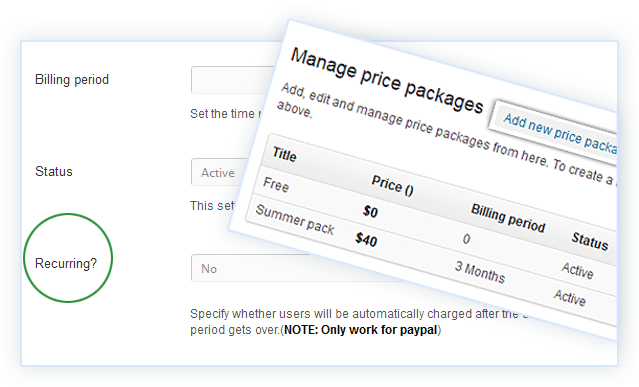 Not only that, the properties theme also allows for creating of recurring packages for users checking out with PayPal. Presenting a responsive and retina ready Multipurpose real estate theme, ideal for creating any kind of property marketplace, or real estate website in minutes. 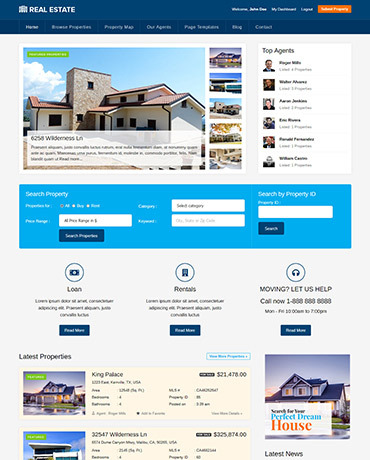 This Real Estate WP template comes with all the features and flexibility you need to create a real estate website of any kind. Create a simple real estate listing website for a broker, builder, and individual user with one or more categories, or a rental property listing site. This Real Estate theme for WordPress is a unique take on the property market niche with focus on powerful backend features and providing a clean look and ease of use. Get started with your real estate website in minutes, and save time, money and efforts. On the other hand, explore all the opportunities to earn through your property management system, with the inbuilt monetization options. Create anything real estate, with this flexible real estate theme. Create a beautifully responsive and mobile friendly real estate website with this Property listing WordPress theme. Mobile friendly and a responsive website will not only boost the user experience, but also help you rank well. Since Google considers the mobile friendliness of your website as a score point for your SEO rankings, this real estate theme is here for double benefits. With this WordPress real estate theme, you can create a user-friendly property website that is easy to search. The real estate theme’s advanced search is one of it’s kind where property hunters can refine their search and find properties by criteria. Use the advanced search features for faster results. For example: filter the neighbourhood and cities, filter using the property category, etc. This guarantees a user experience that inspires them to return to your website whenever they want to search a property. Want to change the fields and details of your property listings. Use the custom fields settings! Make your real estate WP listings comprehensive by adding more details to it. You can totally manage all the fields that appear on your listing submission form. Your users can filter their results based on the custom fields. Crafted with lots of considerations, the property page of this theme for paid and free property advertising website is self expressive. It already has all the required fields for an ideal property listing template. Moreover, you can add more fields as per your requirements. 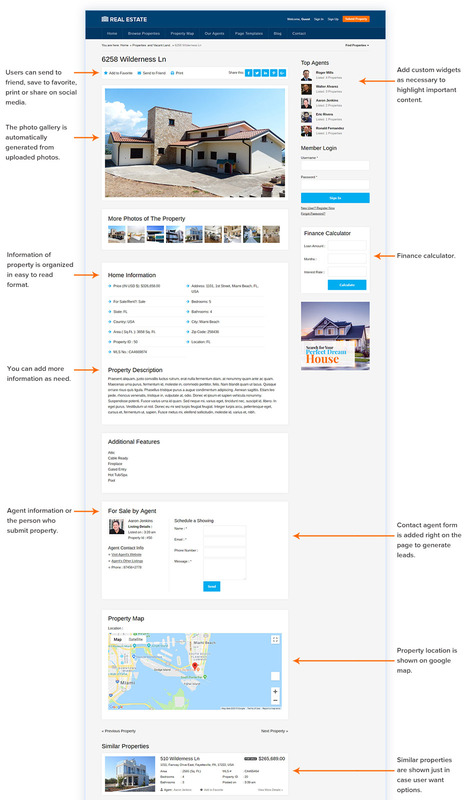 The property detail page acts as an individual portfolio for the houses/properties listed on your website. And it’s in your control to make it as in-depth as possible. Make your website look just the way you want. Choose from the Five detailed color schemes. Just a click and change the color scheme of your entire real estate website. 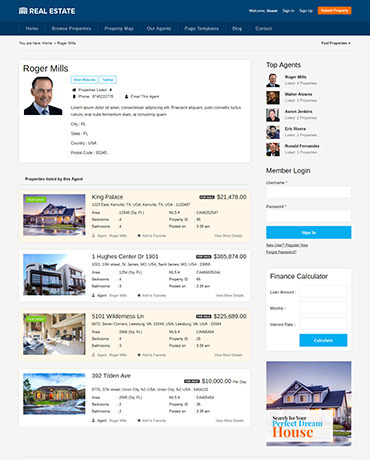 Moreover, this property management theme comes with widgetized page sections. So you can easily change the structure of your real estate website template simply by moving or rearranging widgets in a section. Start your own real estate website on your own, or create a website for short-let/vacation listings, where owners can list their properties. Or you can create a real estate classifieds website where the property owners can post their real estate advertisements. 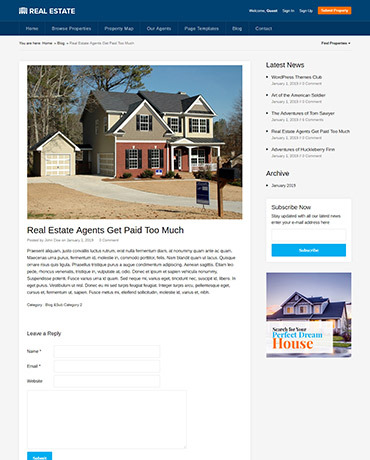 The Real Estate WordPress theme This real estate theme has advanced filtering, ready-made real estate listing pages etc. to let you get started quickly. Without writing a line of code, or paying hundreds and thousands to programmers, you can create your website on your own. Give your site your own personal touch and manage your property listings yourself. 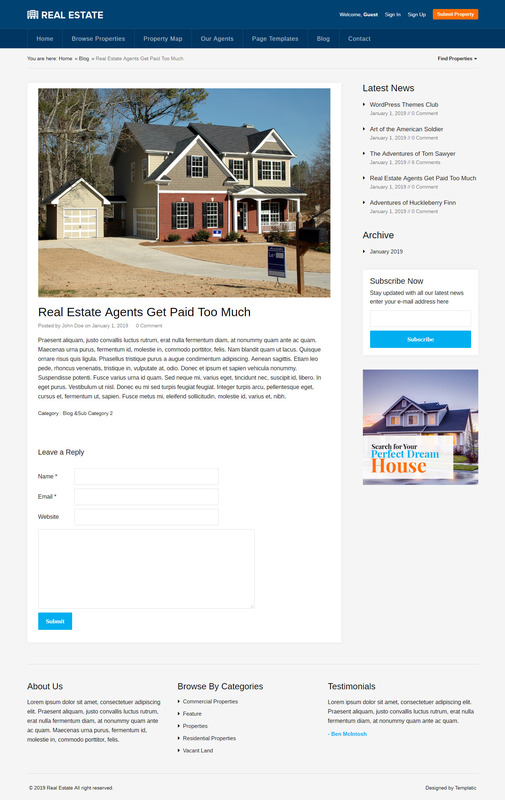 This WordPress real estate theme is so easy to use, that you will enjoy while you earn. The DIY real estate website template is for everyone ready to take control of their own real estate business website. Your search engine for properties can be as massive as it gets, and therefore, it important to keep it organized. So, create categories for your real estate listings that helps keep the real estate listings on your website more organized and easy to access. Besides, there are carefully crafted real estate category pages, that will filter all the listings based on their categories. Also, allow upload listings through the front end under different categories at different prices. So when a user comes to your website looking for office area, he won’t have to go through rental property listings or listing for holiday homes. Your property directory theme is IDX and MLS compatible to pull the active listings from their servers. You can use the dsIDXpress plugin to do so. 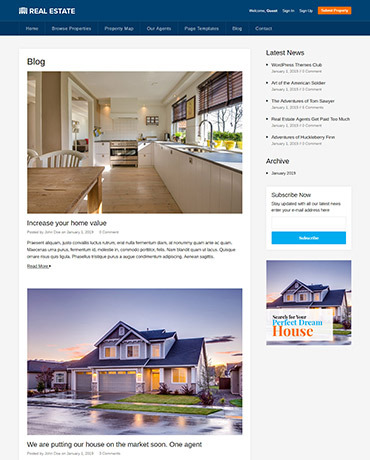 The dsIDXpress plugin integrates seamlessly with this WordPress real estate theme. So integrate MLS listings in your WordPress real estate website through IDX. This WordPress real estate theme comes with more than one ways to earn through your online property directory. With the real estate theme’s monetization features, you can start earning through your website easily. 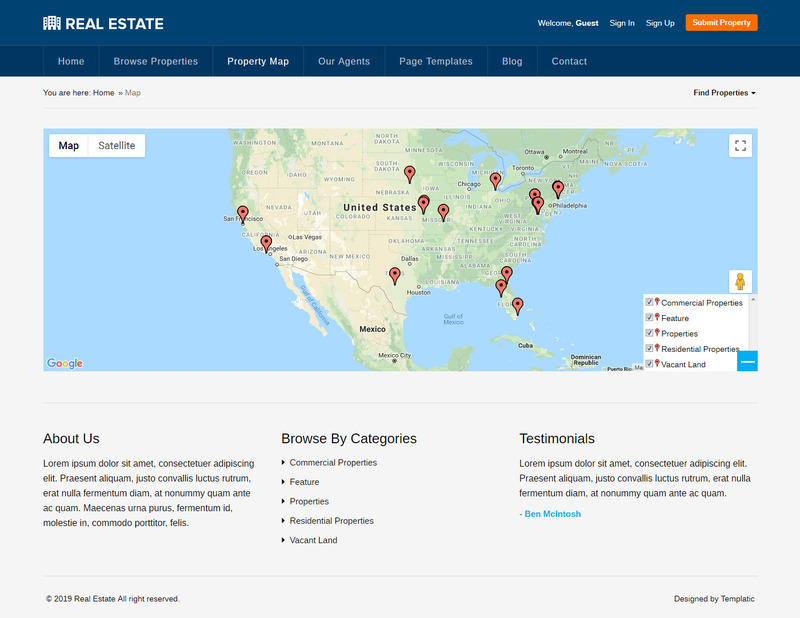 Use this real estate website template to create a property listing directory where you can allow paid real estate listing submission. 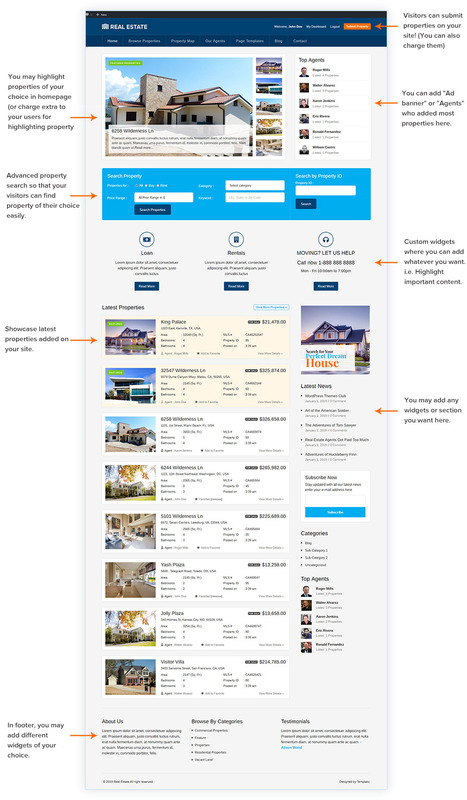 The Real estate theme comes with a flawless front end submission system. You can allow your users to add new listings and get paid for this ads like AirBnB, TripAdvisor, and HomeAway. Create pricing plans and start accepting payments right away with inbuilt payment processing systems on your real estate software. Start earning through your website right away by displaying advertisement banners on your property listing website. The real estate theme comes with inbuilt ad widgets that you can use to display advertisements at any part of your real estate website. The ad widgets lets you display advertisements beautifully, without messing up the layout of your real estate website. Earn more by featuring the real estate listings on your website by featuring listings on the homepage of your real estate theme. You charge more for featured property listings. Earn more by charging the listing owner wants to have his property listing highlighted on the homepage of your real estate website. 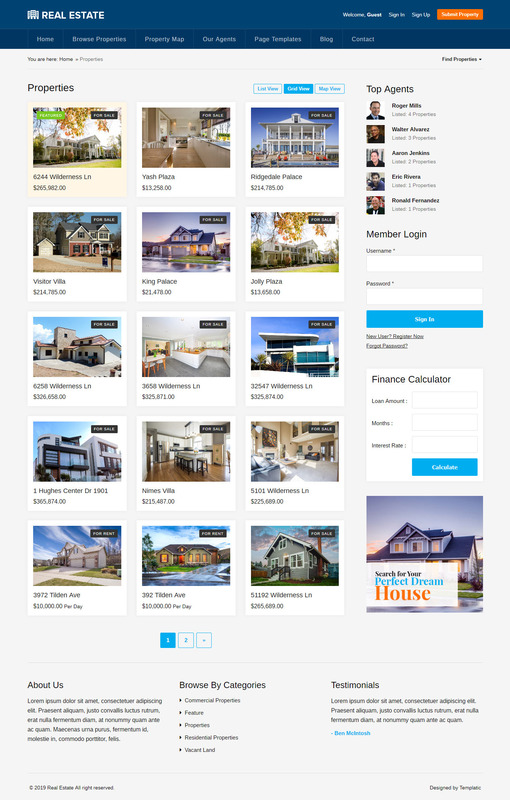 The homepage includes a dynamically generated slideshow of featured properties submitted by the users. If you are a property broker or a real estate agent, you can create your real estate website using this WordPress real estate theme. 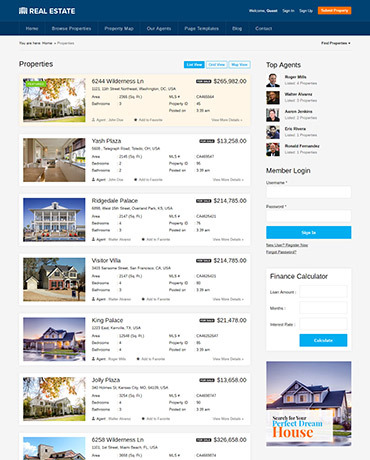 Moreover, you can also use this property WordPress theme to create a property portal where multiple agents can list their properties. The agents can register and you can accept payments to let them post on your real estate portal. 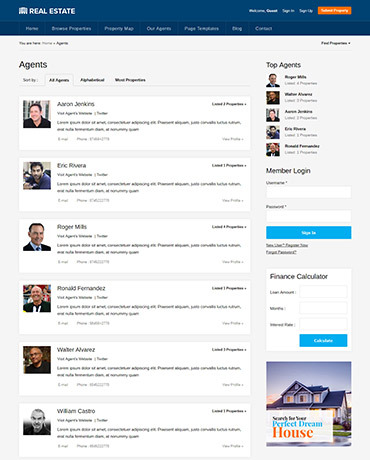 Each agent can have their own portfolio, or the agent pages. This page will display the basic agent information, and contact details followed by all the listings of posted by the Agent. So they can directly share the link of their agent page to their clients. You can obviously use this real estate theme as a directory of free listing of properties. But, you can even allow paid submission on your real estate software. Price packages in this premium Real Estate theme for WordPress lets you easily create payment packages for real estate agents or property owners who want to post their listings on your site. Besides, create category-specific price package with special prices for different property categories. Plus, the properties theme also allows for creating of recurring packages for users checking out with PayPal. 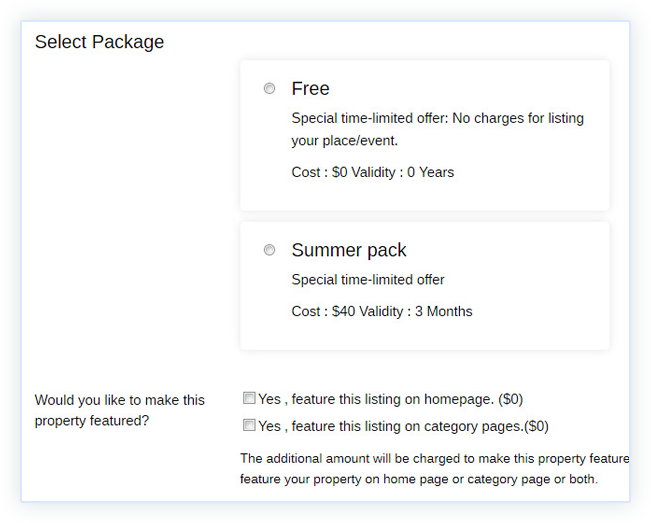 You can create package subscriptions for real estate agents and property owners to choose from. They can pay using the best payment processing systems the real estate 2 theme comes with. There are several built in payment gateways that you can allow your visitors to make payments. If you have a paypal account, the built in paypal payment processing makes it possible to start accepting payments right away. Your dedicated property listing theme is localization ready to create a translated estate sales and property rentals website in your local language. Use this WPML compatible WordPress theme to create a website in multiple language. The real estate theme comes with .po files included to let you translate your website in any language you want. With this WordPress Property management website theme, you can keep a track of all the transactions happening on your real estate website easily. Get transaction reports that reflects all the financial operations on your real estate website. Use the filter and sorting options for various reports related to the transactions on your real estate website. Graphics and maps are easier to understand. So let your visitors search your website directly through Google maps. Besides, there is a map view for individual properties. You can easily turn the maps on or off. 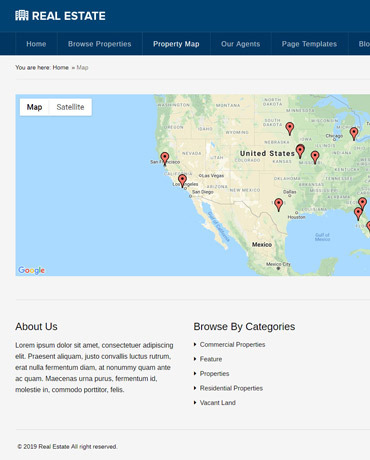 This real estate directory theme with maps lets you create a professional and intuitive property listing website with WordPress in just minutes, effortlessly. Real Estate investors can publish their own opportunities and leave their opinions and reviews on the listed real estate properties. You can create a property review website and let your visitors post their reviews for the property listings on your Real Estate website. The property listing website template comes with an inbuilt Gravatar Support & Threaded Comments, to make your real estate listings more meaningful. 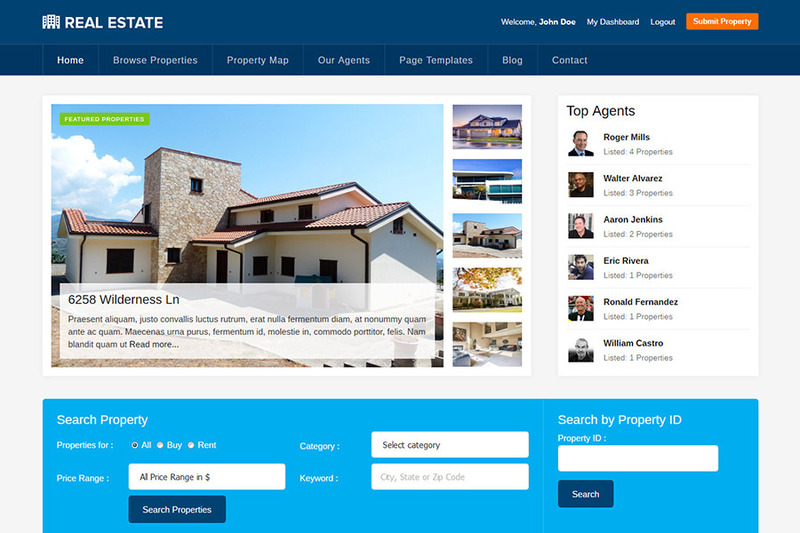 The Real Estate 2 is an SEO friendly and performance optimized real estate theme. 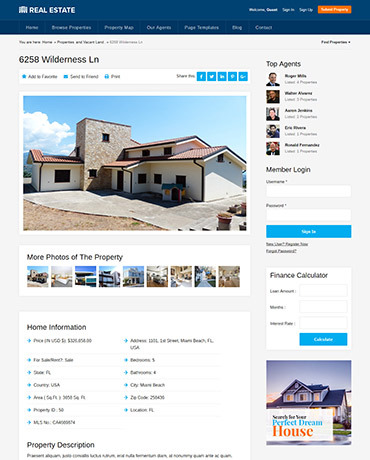 This property listing WordPress template is designed with strict SEO standards. Therefore, with more listings and content on your real estate website, the chances of your property listings to rank in the local search increases exponentially. Also, you can make sure that the content you add on your website is SEO friendly, by using the SEO plugins like Yoast SEO, All in one SEO pack, etc. 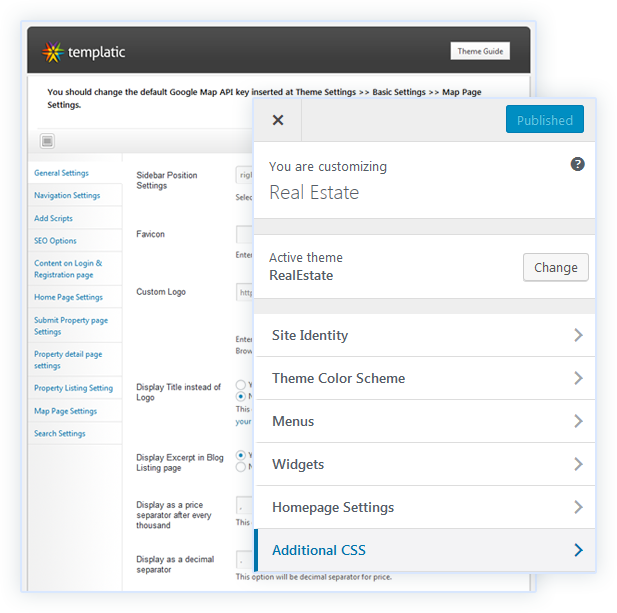 These plugins integrate seamlessly with the real estate WordPress template and helps you create a clean real estate websites with good ranks. Add to favorites feature: Just a button click and your visitor can save his favourite listing for easy and instant access. Several built-in payment gateways: Make it easy to pay. The Property listing template comes with multiple payment options and inbuilt payment processors. Coupon module: Offer discounts and special offers with the coupon module. Make your website more interactive with the coupons! Map view of all the properties: Maps are easy to understand. So show your listings directly on the map for a better understanding. Custom user profile fields: Know your users better by creating all the custom fields for your user profile. Designing your own form was never easier. Bulk Upload/Export (.csv files): Just a button click and you can export all your data to a .csv file. A great way to implement data portability. Manage Transaction Reports: Keep track of all the operations happening on your WordPress website through the manage transaction section. Five detailed color schemes: Change the color scheme of your website by just a single click. Your property search website will look exactly how you want. Translation ready real estate theme (.po file included): Localize your real estate script with the included .po file. This can positively impact the user experience on your local directories. Change Currency: Easily change the currency of your online property management website to start accepting payments right away. 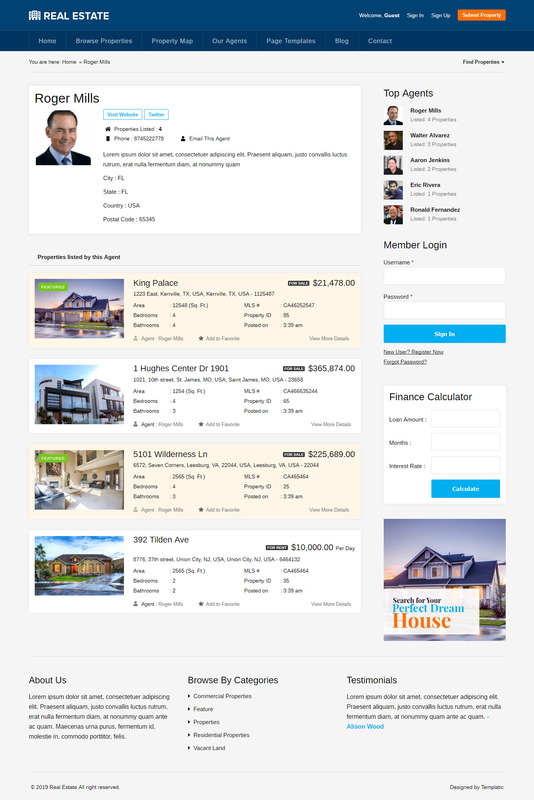 Multi level drop down menu: Implement a flawless navigation with the available menu and mega menus on your real estate website. 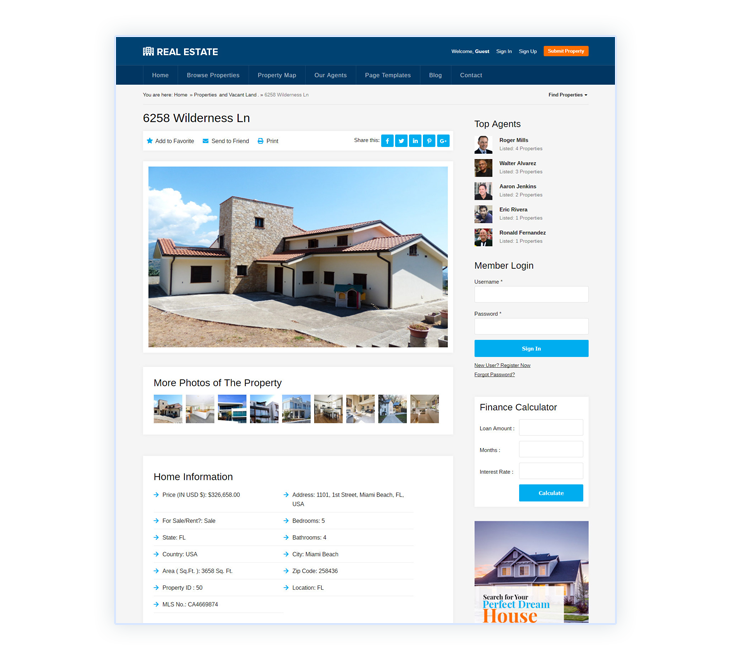 Custom page templates: Get started with your real estate listing site quickly and effortlessly with the pre-designed page templates. Standard WordPress Blog & Pages: Attractive and customizable page designs and the blog section for content marketing and SEO benefits. Gravatar Support & Threaded Comments: Let your visitors post their opinions regarding the listings. A great way to make you site more interactive! Built-in Ad Monetization: Earn easy by simply displaying ad banners or google advertisements on your WordPress real estate website. Full compatibility with Gravity Forms: Easily collect data from your visitors using the free and easy to use Gravity forms plugin. Valid, Cross browser compatible: Your real estate website is designed to look good on any device, any browser! What can you do with the real estate WordPress theme? You can create a property search website, or an online real estate platform with property listings. If you are a realtor or a real estate agent you can create a local real estate agency website. Besides, you can create a property rental, office rental, property rental or website for renovation or new properties. With the features of your Real Estate WP template, you can create a website for local real estate firm or a website for offering real estate services in more than one city. You can create a small real estate website, or massive real estate directories with property listings under various categories, or a web template for real estate advertising. With this WordPress theme for property management company, you can create regular business website in real estate with real estate listings and blogs. The real estate WordPress theme is flexible enough to let you develop a Rental Property site or a property marketplace that lists vacation rentals, villas, condos, or any other rental property. This multipurpose real estate theme is designed to let you create any kind of website related to the real estate industry, effortlessly, and in minutes! 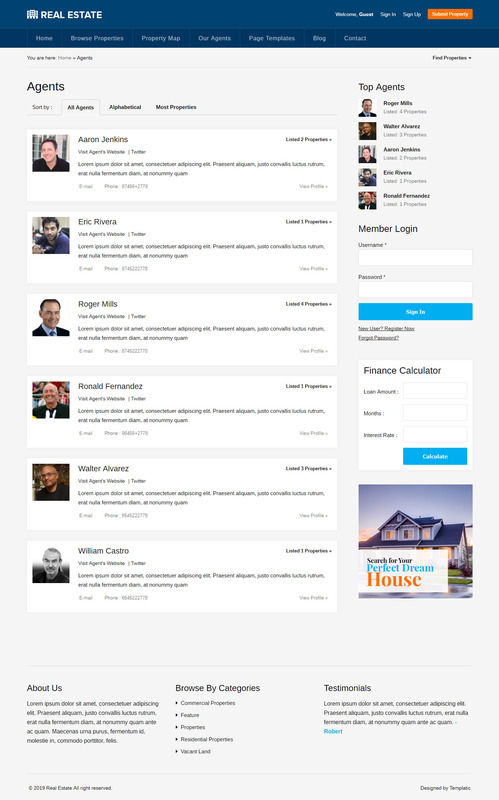 Can I use this theme for mortgage services or a property management portal for tenants and landlords? Yes, Real estate 2 can be used by mortgage brokers to create a basic mortgage website of their own. It also has a loan calculator widget that your visitor can use as a mortgage calculator. Is it compulsory to integrate dsIDXpress plugin with this theme to make it work? Not at all. This property listing WordPRess template can be used to create a real estate website without including any additional plugin. Usine dsIDXpress plugin is optional if you want to pull listings directly from MLS directories. Is XML import and export is possible with this Real Estate theme? Yes it is possible. You can easily export your real estate listing data and then import it. However, you cannot transfer this data from one theme to another because the listings may have different fields. Who can use this WP Real estate theme? This real estate theme can be used by Real Estate Agencies, Landlords, Real Estate Agents to be able to list and sell/rent their properties like houses, offices, lands, conference or meeting rooms, parties spaces, vacation homes, condos, etc. Besides, you can create a website for short-let/vacation listings, where owners can list their properties with advanced search and front-end submission features. Can I set an expiration date for Real Estate listings? Yes, you can set an expiration date on your real estate listing. The listings will automatically expire and will be unpublished when it exceeds the date of its validity. Is there a feature to save the favorite real estate listing? Yes, the logged in users can save a property listing as their favorite by simply clicking a button. The saved listings can be easily accessed by a user so that he can easily revisit a listing he is interested in. Does this theme allow multiple dashboards for different agencies, agents and physical persons? Currently, there isn’t the facility to add different type or users. However, agencies can register using the general registration process and add listings on your site. Besides, they can have their agency profile and all the listings at one page.